Reviewed in Publisher's Weekly Magazine. I came to know David before Crown Financial Ministries and Christian Financial Concepts merged to form Crown Financial Ministries. I had heard about David's heart, ministry, and seminars from friends like George Fooshee, a financial author and Crown board member. One of our ministry's core values is a commitment to developing relationships. I do not know any seminar teacher more gifted at instantly developing a relationship with an audience than Dave Bragonier. You will feel this same personal connection as you read Getting Your Financial House in Order. His wife Debbie also shares her perspective, experiences, and insights in this outstanding book. This gifted couple has helped tens of thousands of people get their financial houses in biblical order. Take an exciting, life-changing walk with them as they share their hearts, their experiences, and God's Word. Applying these principles will enable you to experience real financial freedom and grow closer to our Lord and Savior Jesus Christ. May God bless you as you learn from this choice couple God's financial principles. Chapter 1 "The Front Porch: Reflecting on the Past, Seeing a Vision for the Future"
Chapter 2 "Tools of the Trade, Safety Instructions, and Leveling the Ground"
Chapter 3 "Foyer/Entryway: Stewardship vs. Ownership"
Chapter 4 "Laundry Room: Washing Away the Stains of Debt"
Chapter 5 "Master Bedroom: Husband and Wife Financial Communication"
Chapter 6 "Dining Room: Charitable Giving, Tithes, and Offerings"
Chapter 7 "Kitchen: A Recipe for Financial Freedom (Planning and Budgeting)"
Chapter 8 "Children's Bedrooms: Teaching Children About Money"
Chapter 9 "Den: Savings, Investing, Wills, Retirement, and More"
Chapter 10 "Living Room: Making Your Plan Work"
Chapter 11 "Guest Room: Single-Parent Families"
Chapter 12 "Garage: Repairs and Maintenance"
in getting their financial house in order." their financial house in order." 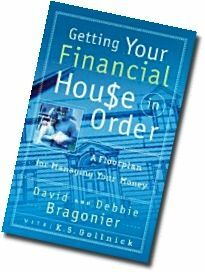 Read reviews of this incredible book, GETTING YOUR FINANCIAL HOUSE IN ORDER (ISBN 0805427201) published by Broadman & Holman Publishers.